Carlisle Cathedral is situated just off the city centre, the Cathedral was founded in 1122 and was built for the glory of god, services have been going in the Cathedral for over 900 years, the cathedral has a shop which is open Monday to Saturday and has a selections of arts and crafts to peruse and buy. Their is a library which has books dating from the 15th century and in 1691 Canon Henry Hutton donated his full library to the Cathedral, their is a vast array of carlisle tourist information in the Cathedral and if you are looking for things to do in Carlisle with the kids it would be a great start to your visit of carlisle attractions. 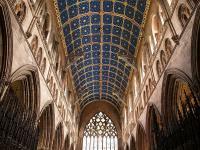 If you are looking for meeting venues in Carlisle the Cathedral also offers conference facilities which could offer something quite unique, with the dining room also perfect for exhibitions giving you a 163 meters of floor space. There is also Carlisle Cathedrals restaurants which can seat 74 which is again perfect for special functions ranging from weddings to anniversarys. 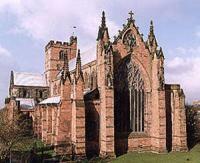 For more tourist info on Carlisle Cathedral please visit their website.